Mônica Salmaso in Concert Born in Sao Paulo in 1971, Mônica Salmaso has surfaced as one of the best young voices in Brazil. At the Disney Concert Hall, she gives a dazzling performance of sensual, rhythmically-inflected Brazilian popular songs, including a Beatles favorite and an "Ave Maria" with a Brazilian twist. 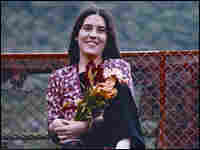 Born in Sao Paulo in 1971, Mônica Salmaso has surfaced as one of the best young voices in Brazil. At the Disney Concert Hall, she gives a dazzling performance of sensual, rhythmically-inflected Brazilian popular songs, including a Beatles favorite and an "Ave Maria" with a Brazilian twist. Discoveries at Disney Concert Hall is an eclectic mix of 10 concert specials recorded live at Disney Concert Hall in Los Angeles and hosted by Renee Montagne. From singer-songwriters to classical, world music and Broadway stars, it's a celebration of the diversity of our thriving musical culture.